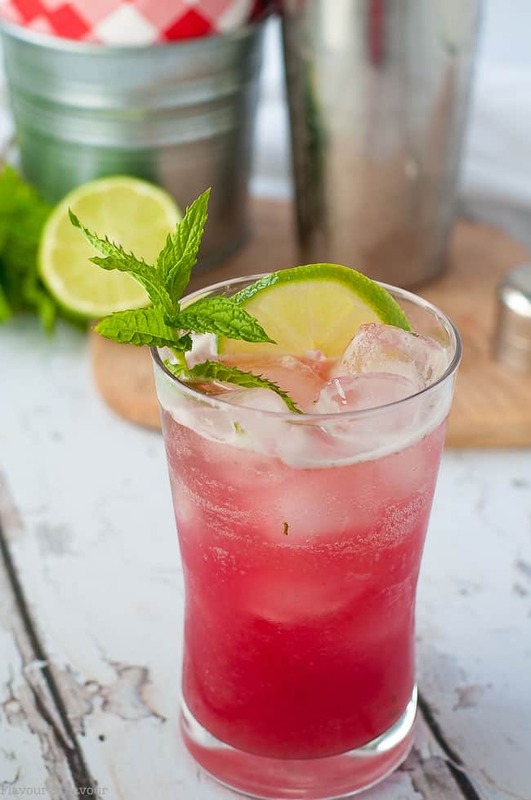 Welcome warmer days with this Rhubarb Mint Mojito, made with a simple rhubarb syrup, fresh mint and lime. 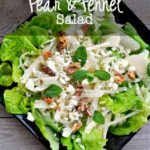 Easy to make it non-alcoholic, too! 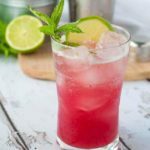 I’m not a fan of sugary cocktails, so this Rhubarb Mint Mojito is an ideal drink for me! It’s a little sweet, but not too sweet, and a little tart, but not overly so. And in fact, I really don’t care if it has rum in it at all! This recipe makes a great mocktail, or non-alcoholic drink that kids like, too. Mint and lime add a refreshing twist to this springtime cocktail. Imagine how welcome an icy glass of like this would be on a hot sunny day! I make this Organic Ginger Mint Cooler often, both with and without alcohol. My grandchildren love the non-alcoholic version. Today I wanted to try something a little different, and with rhubarb ready in the garden, this Mojito mocktail seemed like a good choice. Rhubarb Mint Mojitos for a Crowd! 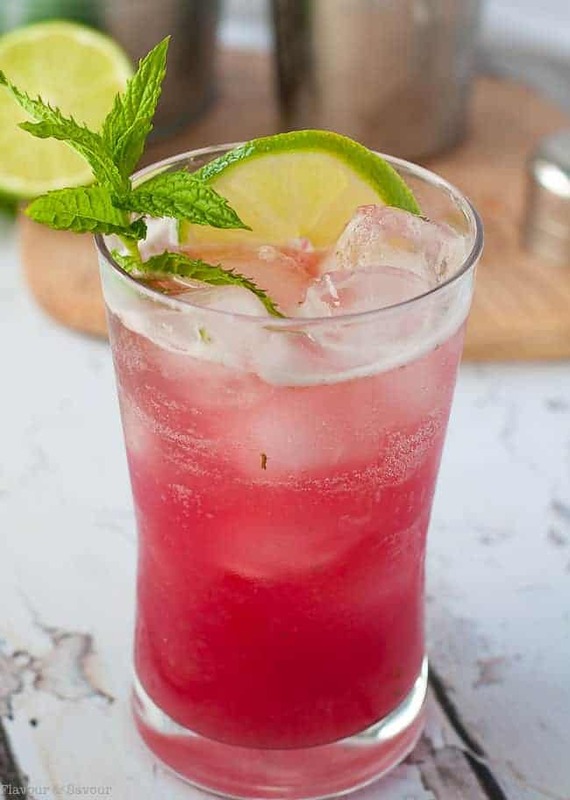 You can make this Mojito for a crowd by doubling the recipe for the Rhubarb Simple Syrup. Make a batch of the syrup ahead of time and store in the fridge. It will keep for up to two weeks. 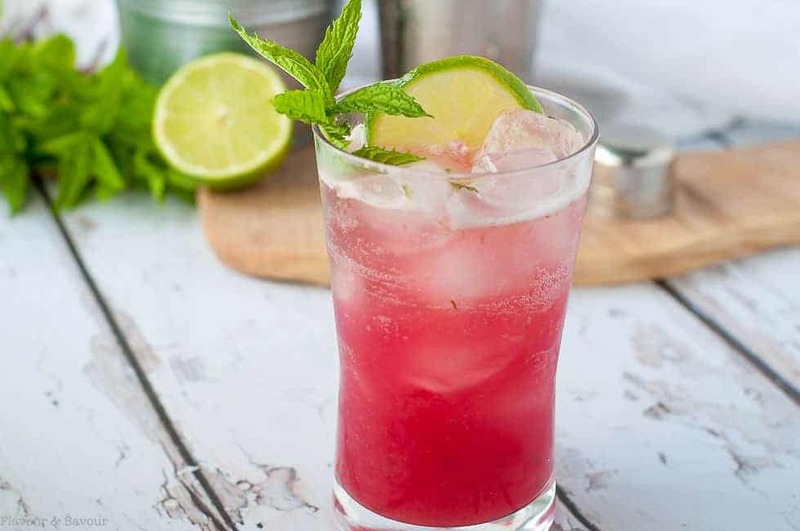 When ready to serve this Rhubarb Mint Mojito, muddle some fresh mint leaves with ice in a cocktail shaker, then add the rhubarb simple syrup, lime juice, and rum and shake until well chilled. Strain into a glass, top with sparkling water or ginger ale, garnish with a sprig of mint and/or a slice of lime and serve to your appreciative friends! Here’s an even easier option, (or for those who don’t like mint.) 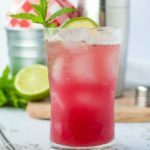 Make a refreshing non-alcoholic drink by adding two ounces of this rhubarb simple syrup to a glass with ice. Top with natural artisan ginger ale or sparkling water. 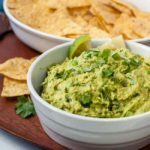 Add a squeeze of lime juice and a slice of lime and serve! Looking for more ways to enjoy rhubarb? Here are 10 Ways to Use Rhubarb Besides Pie! 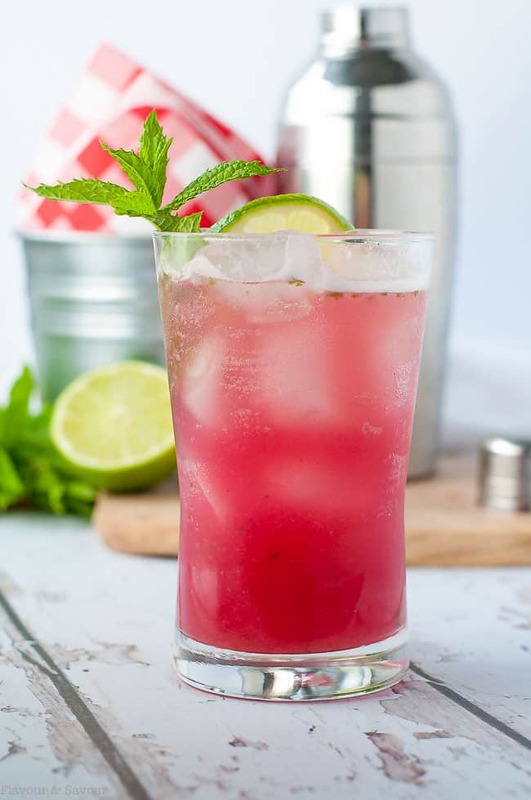 Celebrate spring and summer weather with this recipe for a Rhubarb Mint Mojito, made with fresh ingredients from your garden or farmer's market. Not too sweet! 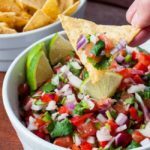 Combine all the ingredients in a small pot. Bring to a boil then reduce to a simmer. Simmer for until rhubarb is soft and mixture has thickened. Remove from heat and strain through a fine mesh sieve. Pour into a jar or bottle and let cool completely. The syrup will keep covered in the fridge for two weeks. This will make enough for 4 -6 drinks. Add 5 large mint leaves to a cocktail shaker. Fill half full with ice and muddle with the end of a wooden spoon. Add 1/4 cup rhubarb simple syrup. 1 oz. white rum and 3 tablespoons lime juice. Shake until well chilled. Strain into a glass. Fill 2/3 full with ice cubes and top with sparkling water or ginger ale. Garnish with a mint sprig and/or a slice of lime and a pinch of nutmeg (optional). Simply follow all directions, but omit the rum. Add extra sparkling water or ginger ale if desired. Are you a rhubarb fan? 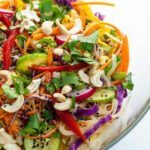 You might like these recipes, too.